(CNN) -- Usain Bolt broke his own world record in the 200m meters as he completed the sprint double in the world championships in Berlin in sensational style. The remarkable Jamaican took gold in 19.19 seconds, shaving just over a tenth of a second off the mark he set in winning the 200m at last year's Beijing Olympics. Bolt smashed his own 100m world record with a 9.58 seconds clocking in claiming gold in the shorter sprint on the second day of the championships. Bolt, who celebrates his 23rd birthday on Friday, made a fine start and was well clear of the field coming around the bend, clearly pushing to the line as he eyed his old mark of 19.30 seconds. Alonso Edwards of Panama claimed a fine silver in 19.81 seconds with Wallace Spearmon of the United States taking the bronze in 19.85 seconds. Bolt will bid to emulate his triple gold medal tally from Beijing in the sprint relay for Jamaica in the final day of the championships on Sunday. Earlier, Jamaica's gold rush in Berlin continued with victory for Melaine Walker in the women's 400m hurdles. Walker ran the second fastest time in history of 52.42 seconds to relegate Olympic champion Lashinda Demus of the United States to the silver medal position while Trinidad and Tobago's Josanne Lucas took bronze. I was just going over my comments and noticed that you have replaced my quotation marks with question marks. Why? Anyway back to the sports. Bwoy mi proud soh till all ah mi proudness drop a groung!! I have always been proud of my country whether good or bad. Oh by the I am always in attendance of the Penn Relays and at Reebok Grand Prix. Well at the most recent Penn relays I saw this tall guy he must be already 6 ft I think his school is Homehood I am not sure but remember I tell you thats another Usain Bolt in the making. There were so many great high school athletes on display at the games. The future is really looking great for us. I hope Jamaica will stop sending our less than best professional athletes to compete among the other countries best at the Penns. More than 1/2 the stadium are Jamaicans - come on people. Usain Bravo ! the fastest is in Jamaica ! Right now lickkle Jamaica are first in the medal table ahead of the once mighty US and Russia.To me, Bolt is the greatest sprinter ever. Has anyone noticed how peeved, to say the least, the US girls have been looking after their defeats by the Jamdown daughters. The world sport has changed, don't let the Americans dominate the track and fields in any world sport events. Congratulation to Jamaica. The only thing better than Bolt and company today, was my favorite program on the ESPN "Around the Horn" had Usain Bolt at the top....yes the very top of their discussion list today. Mind you this is an American domestic program. GREAT RAH!!!!!! RAH!!!!!!! Finally the sport is getting cleaner and cleaner and real talent can shine forth. Anyway ? 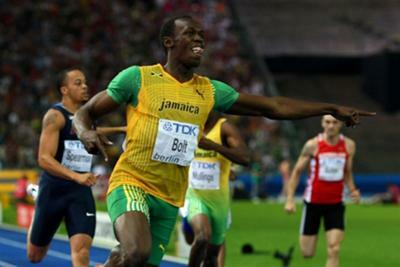 mi no sey noh amount ah dope up athlete caan sparks against Bolt? Tthe man is just gifted! All who are trying to find out what our secret is it is just as simple as this; We believe in being the best at everything that we do whether good or bad. Our Island is so full of talented people especially athletically. ?unuh heva si di little young bwoy dem a jump haffa some blow wow tree ina deep river. Trust mi a just chew wi no ave noh money if develope our talents.? Do you guys realize that we are less than 1% of the US population? Right now we are place 2nd to them in the IAAF World Championship. ?Mek wi clap wi self, wi lickkle but wi talawa!? Jamaicans have always excelled primarily because of the many ways we have learned to survive. This has to be the coolest running yet! with more to come the futures bright the futures Bolt Ya Mon 1 love. Melaine Walker is also the reigning OLYMPIC CHAMPION!